Cardinal Gibbons' Jonathan Ley, left, tries to gain position on Orlando Lake Highland Prep's Chris Rivera in the Class 1A 145-pound weight class at the FHSAA Wrestling Finals on Saturday, March 9, 2019, at the Silver Spurs Arena in Kissimmee. 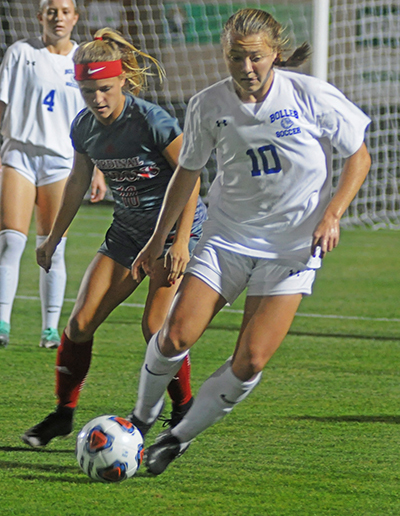 Cardinal Gibbons midfielder Chloe Depenbrook defends Bolles midfielder Avery Patterson during the first half Wednesday, Feb. 21, 2019. Bolles defeated Cardinal Gibbons 5-1. 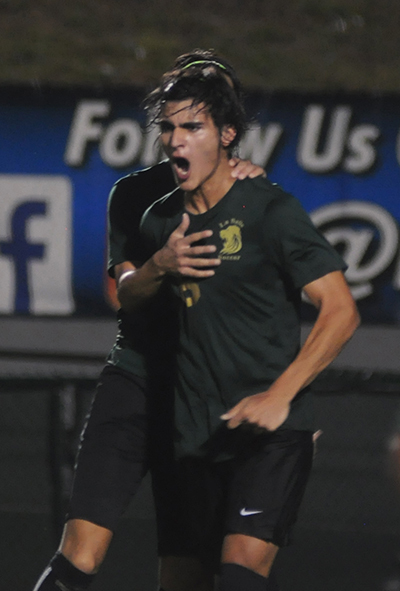 It was Cardinal Gibbons' first state final since 2009. Editor’s note: This material was compiled from Florida High School Athletic Association sources. 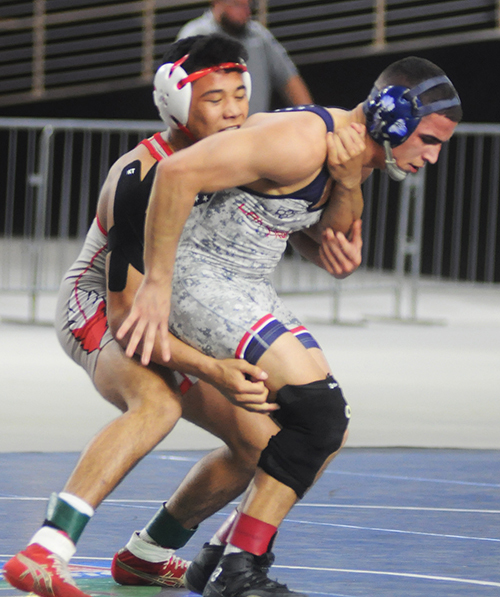 KISSIMMEE | Cardinal Gibbons and Christopher Columbus each ran into dynasties to post top-five finishes at the state wrestling meet. The Archdiocese of Miami also had one girls basketball team, two girls soccer teams and one boys soccer team advance to their respective state finals. Cardinal Gibbons finished third in the Class 1A state wrestling meet March 9 at Silver Spurs Arena. The Chiefs finished with 96 points. Orlando Lake Highland Prep won its fifth title in a row with 269 points. Jonathan Ley took second place for the Chiefs in the 145-pound class. Lake Highland Prep’s Chris Rivera took a sudden victory over Ley while Rivera was leading 3-1. Shane Cannon took third in the 170 class, Damiani Castro took fourth for the Chiefs in the 182-pound class. Daniel Ellison won the fifth-place match, beating Bishop Kenny’s Andrew Slade 9-7. Msgr. Edward Pace’s Ray Lugo took third in the 1A 220 class. He beat Delray Beach American Heritage’s Chase Thompson 5-3. Columbus took fifth in the Class 3A meet with 84 points. Homestead South Dade won its sixth consecutive title — the longest current streak — with 197.5. Carmine Dascoli had the Explorers’ best finish, taking second in the 195 class. He lost to Clearwater Countryside’s Anthony Burburija, who finished a 210-0 high school record by defeating Dascoli by fall at the 1:08 mark. Dascoli had won all three of his state matches by fall. St. Thomas Aquinas had three wrestlers in the top 5, with two clinching their places with victories over Columbus wrestlers. The Raiders finished 14th overall with 46.5 points. Dylan Burton took third in the 126 class by beating Columbus’ Justin Valdes 8-7. Gianni Guerrero took fifth for the Raiders by beating Columbus’ Ryan Gonzalez 5-4 in the 152 class. John Pope also took fifth, beating Dr. Michael Krop’s Isaac Joseph by fall at the 2:17 mark. St. Thomas Aquinas' Abigail Hsu, left, drives past Tampa Bay Tech's Janiah Barker in the first half of Tampa Bay Tech's 58-52 overtime victory Saturday, March 2, 2019 in the FHSAA Class 8A girls basketball state championship game at the RP Funding Center in Lakeland. Hsu had 10 points, while Barker had 17 points and 10 rebounds. In the Class 3A dual team wrestling state tournament, St. Thomas Aquinas reached the quarterfinals. The Raiders beat Santaluces, then Park Vista before losing 46-18 to Fort Pierce Central. In Class 1A, Cardinal Gibbons advanced to the second round before falling to American Heritage. The Chiefs beat Lincoln Park in the first round. 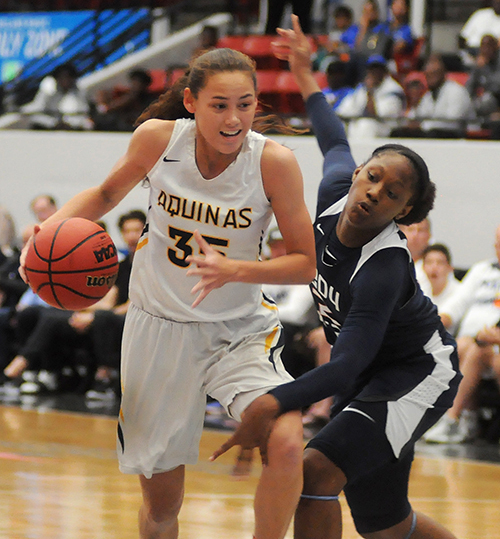 St. Thomas Aquinas advanced to the Class 8A state final but fell in overtime to taller Tampa Bay Tech, 58-52. The Raiders (22-6), who had a five-game winning streak snapped, reached their first state final since 1994. Tampa Bay Tech (27-3) was in its first state final in school history. See separate story on the archdiocesan website: https://bit.ly/2SZXgCc. In Class 9A, Our Lady of Lourdes Academy lost in the region finals 64-33 to Miami. Lourdes routed Miami Killian 66-31 and Miami Southridge 55-40 to reach the region final. In Class 6A, Archbishop Edward McCarthy lost in the region quarterfinals 62-54 to Lincoln Park Academy. In Class 5A, Msgr. Pace lost 42-37 to Fort Lauderdale Pine Crest in the region quarterfinals. Toumani Camara (3) led Chaminade-Madonna to a 21-7 record, including a region-semifinal finish, in 2019. Camara signed to play basketball at the University of Georgia. In Class 7A, Belen Jesuit reached the Region 4 semifinals, falling to Doral Academy 49-41. The Wolverines finished runner-up to Doral in District 16, then beat Miami Norland 50-41 in the region semifinals. Two archdiocesan teams made the Class 5A regionals. 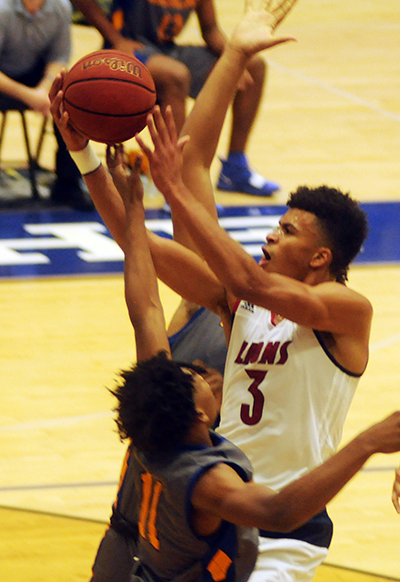 Hollywood Chaminade-Madonna finished runner-up to University in District 13, then lost to University 68-56 in the region semifinals. Chaminade beat Mater Lakes 75-54 in the region quarterfinals. Msgr. Pace also finished runner-up in District 14-5A, losing to District 13 champion University 87-53 in the region quarterfinals. Immaculata La Salle midfielder Lucas Rodriguez, front, celebrates his goal with teammate Enrique Mejia during the second half of their Class 2A boys soccer final against Orlando Lake Highland Prep on Thursday, Feb. 21, 2019, at Spec Martin Stadium in DeLand. The schools tied 1-1 through regulation and overtime, but Lake Highland Prep won 5-4 on penalty kicks. Immaculata-La Salle reached the Class 2A boys soccer final, and although they didn’t win, they made school history in the process. It was the first the school, currently marking its 60th year, had vied for any state championship in any sport. The Royal Lions battled Lake Highland Prep to a 1-1 tie, then lost 5-4 in a penalty shootout. (See story: https://bit.ly/2TOKviA). St. Thomas Aquinas reached the Region 4-4A finals before losing to state finalist Fort Lauderdale 1-0. The Raiders beat Belen Jesuit 4-0, then Doral Reagan 1-0 to reach the region final. Columbus lost to Coral Reef 2-1 in the region quarterfinals after winning District 15-5A. In Class 2A, Cardinal Gibbons finished runner-up in District 14, then lost to West Palm Beach King’s Academy 1-0 in the region semifinals. Archbishop McCarthy and Cardinal Gibbons each advanced to the state finals. McCarthy’s Lady Mavericks ended a 25-0 season at number 6 in the national rankings but couldn’t overcome Montverde in the state final, losing 1-0 to another undefeated, nationally ranked (at number 2) team. (See story: https://bit.ly/2VQtJg8). Gibbons, likewise, fell 5-1 to now eight-time champion Jacksonville Bolles in the Class 2A championship game. It was the first time the Chiefs had reached the state final since 2009. (See story: https://bit.ly/2VVPuLD). Our Lady of Lourdes’ journey to a Class 5A title defense was derailed by Weston Cypress Bay, who beat the Bobcats 1-0 in the Region 4 finals. Lourdes won District 15-5A, then beat Palmetto 1-0 and Coral Reef 4-3 to reach the region final. In Class 4A, St. Thomas Aquinas fell to state finalist Archbishop McCarthy 1-0 in the region semifinals. The Raiders finished runner-up to McCarthy in District 15, then beat Doral Academy 4-0 to reach the region semifinals. Archbishop McCarthy finished tied for 19th with 4 points. Panama City Beach Arnold won with 23 points, edging Leesburg by 1 point. Senior Sophia Arce finished fourth in the state 101-pound class with a 220-pound total. She bench-pressed 100 pounds and clean-and-jerked 120. Alexis Green scored the Mavericks’ other point, finishing sixth in the state 199-pound class. She lifted a total of 325 pounds, bench-pressing 170 and clean-and-jerking 155. Teammates Arianna Reyes, Gabrielle Ashkenazi and Christian Pommells also qualified for state. 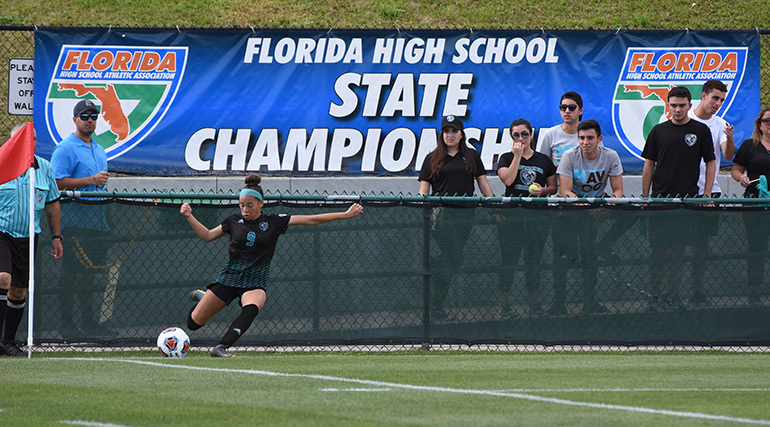 Archbishop McCarthy High forward Nadia Colon executes a corner kick during the Class 4A state championship soccer final in DeLand, which McCarthy lost 0-1 to another nationally ranked team, Montverde Academy.